Picador Poetry Editor, Don Paterson, on celebrating two decades of the finest contemporary poetry. I hope you’ll join us in celebrating our twentieth anniversary, now that two decades have passed since we published our first book, Robin Robertson’s A Painted Field. Picador Poetry came more or less immediately in the wake of Picador’s decision to reinvent itself. It had long been a publisher of American and European classics: readers of a certain vintage will remember grabbing ‘a Picador’ randomly off the bookshop shelf, and many of us simply regarded Picador as a way of getting a cheap education. Now, Picador would publish original work under its own name. Peter Straus, our boss back then, decided that any imprint with pretensions to literary seriousness needed a poetry list, and for reasons that I still don’t entirely understand, I was approached with the task of editing it. From Straus to the present Picador publisher Paul Baggaley, I’ve been fortunate to work for a number of people who believe in the intrinsic cultural value of poetry, and see no particular reason for it to have to keep defending its own existence. Their own role as guardians of the art is shockingly under-appreciated, though not by me. ‘The collective noun for poets’ is something of a perennial drunken parlour game, and the answer is far from settled: when two or three versifiers are gathered together – are they a posy, a posturing, a paranoia, a pointless? But the truth is that there probably can’t be a collective noun for poets: they all regard themselves as unique. Whenever art gets competitive, artists can often end up looking like, sounding like, or writing like each other – otherwise, how would you know who has won? But poets have always been a bit different, and know that they ‘win’ by being the least like anyone else they possibly can. It’s been our aim, then, to publish nothing but the most original poetic voices we can find. Starting with Robertson, we built the list on the singular talents of the likes of Carol Ann Duffy, Paul Farley, Kathleen Jamie, Kate Clanchy, Michael Donaghy, Sean O’Brien, Jackie Kay and Jacob Polley. Our aim, from the beginning, has simply been to bring the very best in contemporary poetry to as wide an audience as possible, and I would like to think that Picador Poetry has no ‘house style’ other than broad excellence. Although it remains a pretty select list with around thirty-odd poets, we publish writers from across the poetic spectrum, from Denise Riley to Billy Collins, from Kate Tempest to Clive James, from Colette Bryce to Timothy Donnelly. Even without publishers and readers, poets will go on doing their thing, as they really can’t help themselves. But without a supportive readership, their voices can easily go unheard – and if they do, our culture dwindles. Poetry’s purpose is to ‘do work on the language’, and make it adequate to reality: we turn to poetry whenever we meet a situation, a feeling, an event that we can’t describe ‘in the usual way’. When words fail us, the poets step up. That we need poetry now more than ever hardly needs saying, and without you to read it, share it, spread its word – poetry cannot do its work. And if you haven’t got into poetry before . . . Let me just say this: poetry is a distinct pleasure, and unlike any other art form. It requires no special knowledge to enjoy it, just the patience to tune to its unique way of doing things; and once you’ve dialed into its wavelength, I can promise you’ll never want to go without it again – and nor will the world ever look quite the same. For the first Picador Poetry Twenty event in Brighton on 18th May, Picador’s Poetry Editor Don Paterson presented Glyn Maxwell, Lorraine Mariner, Hollie McNish, Richard Osmond & Kate Tempest, who all performed their work. 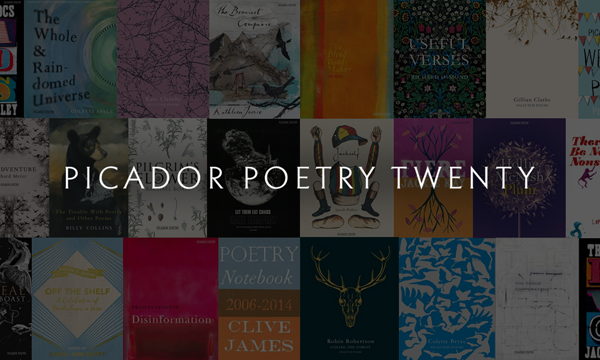 See more of the event, and share your favourite Picador poetry on Twitter using #PicadorPoetry20. Watch the first Picador Poetry Twenty event on the Brighton Festival website. The next event will be the Picador 20th Anniversary Poetry Showcase at the Cheltenham Literature Festival on Sunday 15th October 2017. Don't miss out on tickets! Click the images below for poems, features and to find out more about each of our poets.